An excellent successor to Red Dead Redemption 1, this game is well known for its ridiculously massive open world, with every single detail perfected down to the last blade of grass. Rockstar really went all out on this one! Sure, the graphics are extremely impressive, impressive enough to be called a step up from most video games that are around these days, but all things considered, RDR2’s open world definitely takes the cake as the best part of this game. Of course, that doesn’t come as a surprise since Rockstar is clearly a master when it comes to the genre of open world. 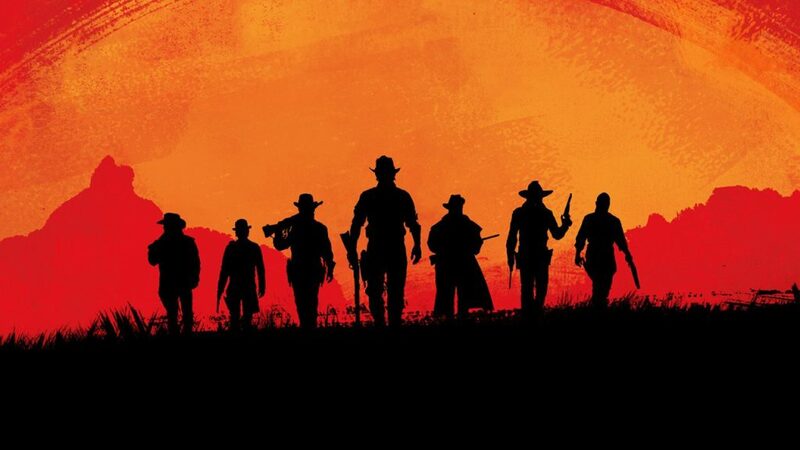 Considering Rockstar’s previous track record, from their 2005 game ‘Bully’, as well as their long-running franchise, Grand Theft Auto, players expected nothing less with the release of RDR2, and they certainly haven’t been let down. If you have played GTA V (I mean, who hasn’t? 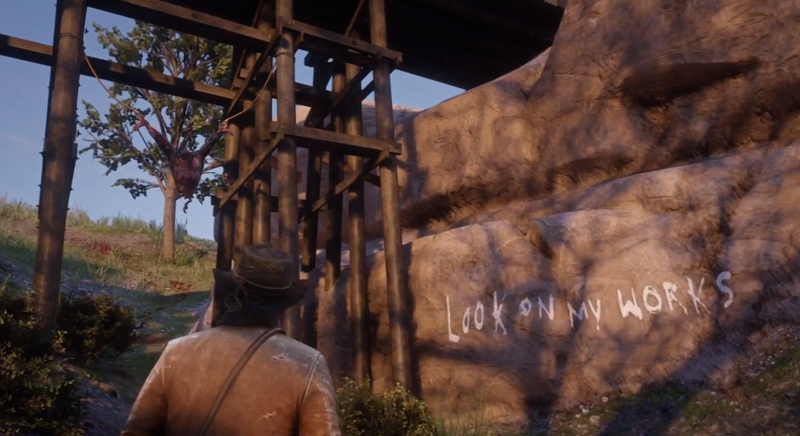 ), then you may be familiar with Rockstar’s habit of stuffing their open worlds with subtle Easter eggs and mysteries, which is exactly what they have done with RDR2… just about 10 times as much. Of these Easter eggs and mysteries, plenty of them are horrific and that’s what will be touching on right now. 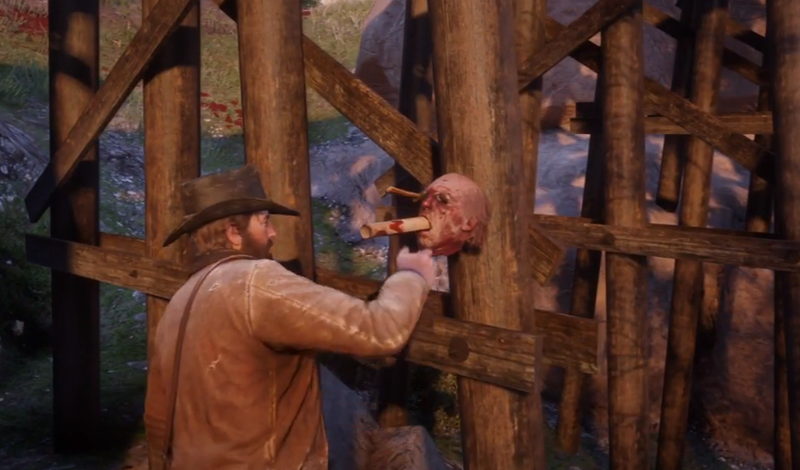 Rockstar isn’t exactly shy about their horrific content, which is also the case with most other video game design companies, and there is plenty of gruesome stuff you can find scattered all around the expansive Wild West, with some of them included as parts of missions. 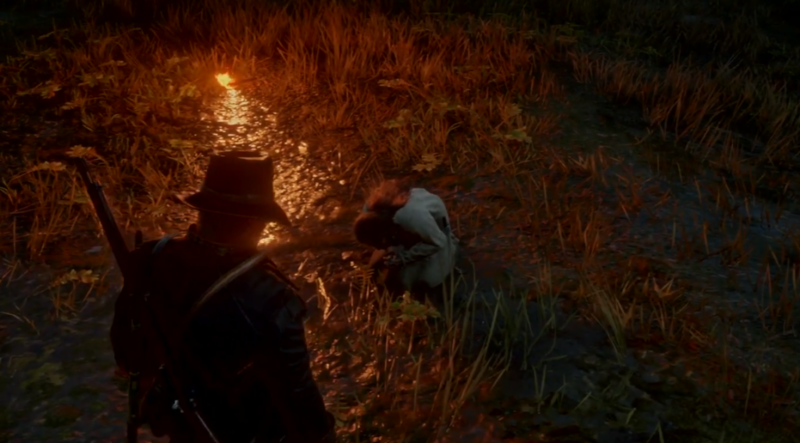 One of the first gruesome things that you’ll come across when playing RDR2 is the string of murders performed by a serial killer. Here, you will investigate a series of mutilated bodies strung up across trees and boulders in an attempt to find the person who butchered them. 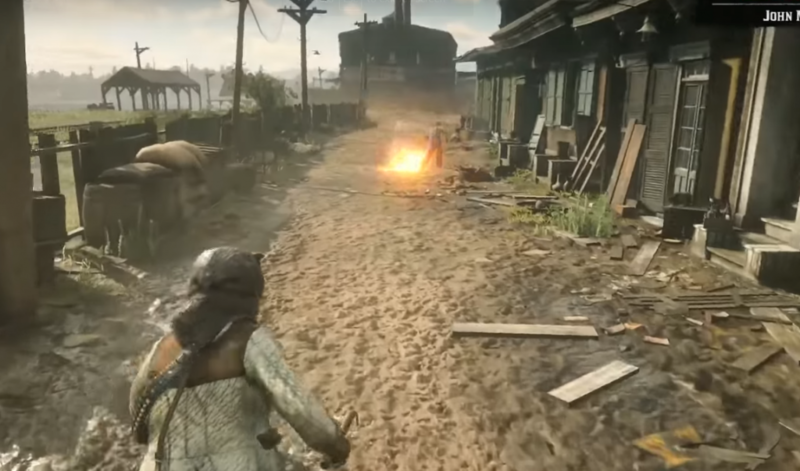 Sure, mutilated bodies and people ripped off in half isn't something new in the world of video games, but combine the terrific graphics of the game with Rockstar’s tremendous attention to every shred of the dead person’s gushing insides, and you’re bound to feel creeped out with every drop of blood that slowly drips from the dead corpse. Of course, your mission has to continue, so the serial killer conveniently leaves you a piece of a map that will eventually let you figure out his hideout, and of course, the map will be stuffed into his victims’ mouth. So, once you try to retrieve it, you’ll have the pleasure of watching the poor guys’ head fall right off. Oh, by the way, did I mention? Once you figure out the serial killers’ hideout, you gotta go take a look, and that place is… let’s just say… not the type of place you’d want to host a kid’s birthday party. Next up on the list of horrifying stuff, are the Night Folk. These guys are a bunch of psychopathic killers who hang out near the swamp, and you are most likely to encounter them during the night. Yeah, the swamp… at night. 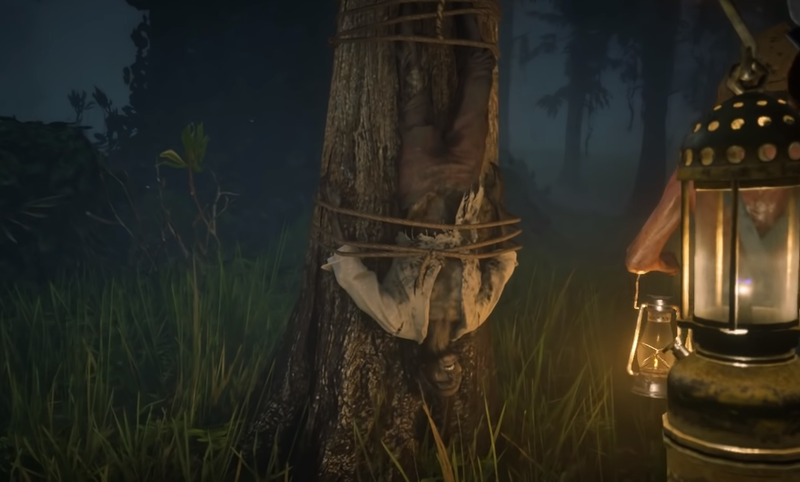 I mean, you’d think the swamp was creepy enough during the day, what with all the crocodiles and snakes, but now you have to go into the misty swamp during the night, with nothing but a lamp to light your way. 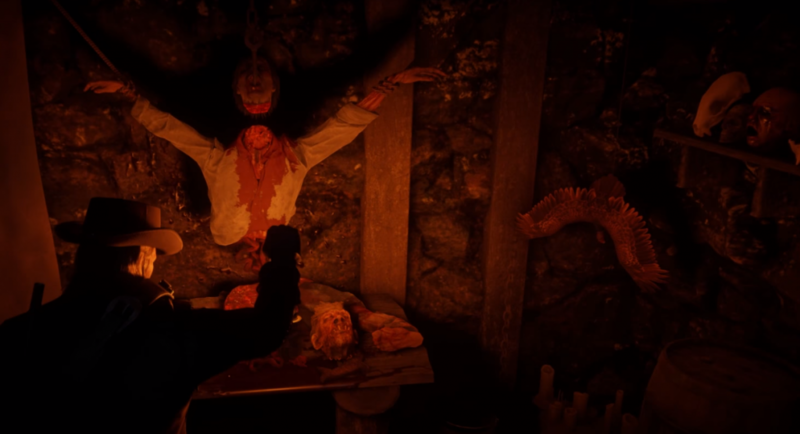 In any other video game, this wouldn’t be so creepy, but the sights, the sounds, and the immersive experience RDR2 provides really gives you the chills. Imagine walking along this misty swamp when you suddenly see a woman, completely dressed in white, crying near a small fire. 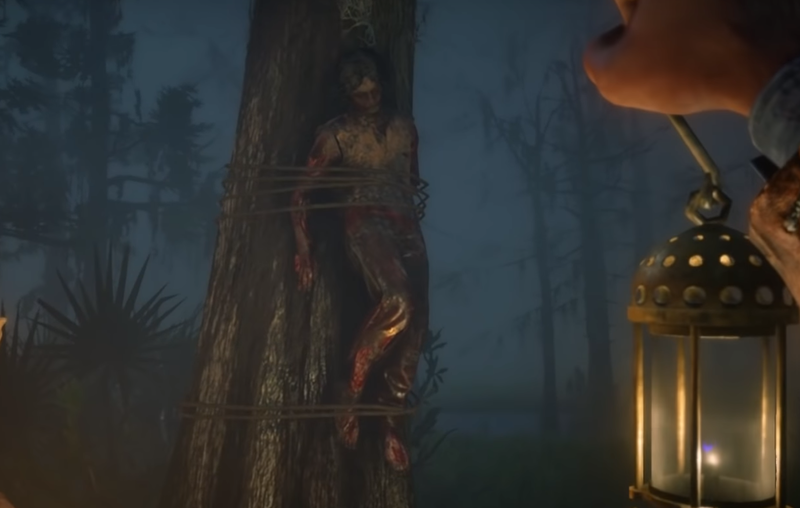 Or how about a freshly bloodied dead body tied to a tree? No? What about a dead body that has been tied to a tree for years? It’s all part of the joy the Night Folk provide. 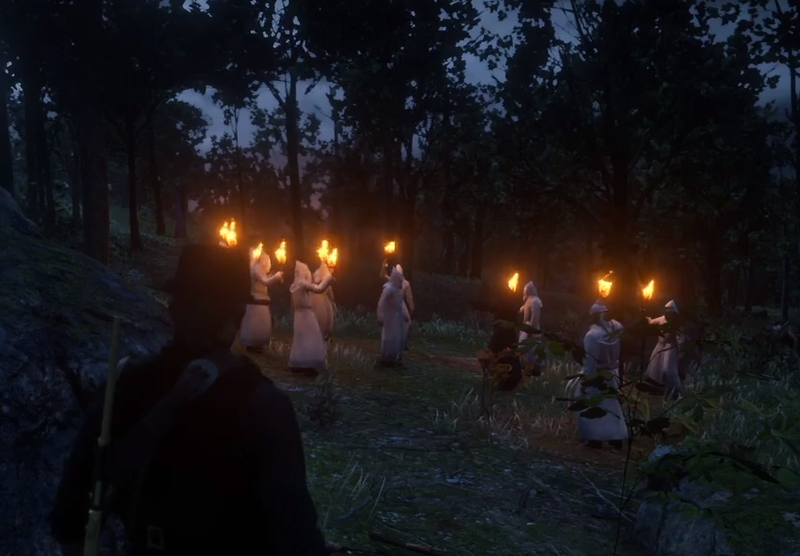 While traveling across the Wild West, you may come across a bunch of enterprising individuals having cult meetings, namely, the KKK. Since this encounter occurs in the woods during the night, you may consider it creepy, but there is also a pretty funny side to it. In the very first meeting, you’ll hear the leader of the cult mention that their numbers are waning, and while they blame the Congress for that, you’ll soon see that it’s for the most part, due to their own stupidity. Here, the cult is introducing a new member to their ranks, and as initiation, the new member lights a huge cross on fire right before the flames get to him, setting him on fire as well. Moral of the story? Long robes and fire don’t mix! You will also meet the KKK on to other separate occasions where they end up doing something stupid and killing themselves. Or you can save them the embarrassment and kill them yourself. You can kill any of the members of the KKK without having to worry about your honor points degrading, so go ahead, knock yourself out. Now, the game itself is inherently violent and you’ll encounter a lot of terrible stuff on the way, but maybe you aren’t content with watching other people do bad stuff. Maybe you want to be the terrible one? Well, go right ahead, because there is absolutely nothing stopping you! But of course, do remember that being a terrible guy will get you a terrible reputation. No one takes too kindly to a guy that goes around, say, killing a bunch of children? Children are precious, and that’s why Rockstar thoughtfully placed a bunch of kids in the game. But nope, you can’t just use one of your weapons to lay the contents of their brain onto the pavement, because none of your weapons have any effect on them. This is similar to the approach most other video games that contain children take, such as BioShock, for instance. After all, the last thing Rockstar wants is bad PR. However, there is nothing stopping you from shoving kids around, throwing them around on the ground, running them over with your horse, pushing them on the train tracks, along with a couple of other delightful things that will tickle your inner sadist. If you’re done with the kids, then it’s time to focus on the adults, because you’ve got options. It's no wonder RDR2 is a little bit on the fat side when it comes to file size because it's like every NPC has been given a separate personality. 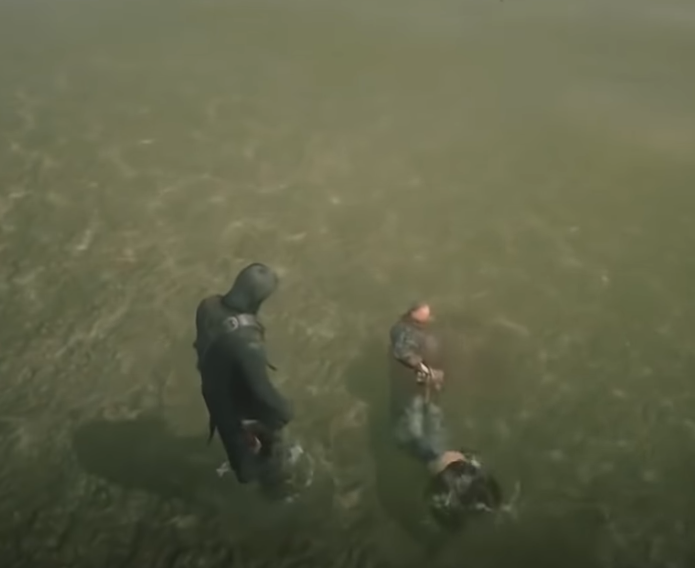 Your character seems to have something to say to each NPC, and each NPC has a different view of the world around them, so if you find someone whose view of the world doesn't fit yours, it's perfectly fine to tie them up and throw them into the sea so you can watch them drown. Shoot a sweet old lady in the head. Tie up an old man then drag him around behind your horse. Beat a deformed guy to death. The opportunities are simply endless! 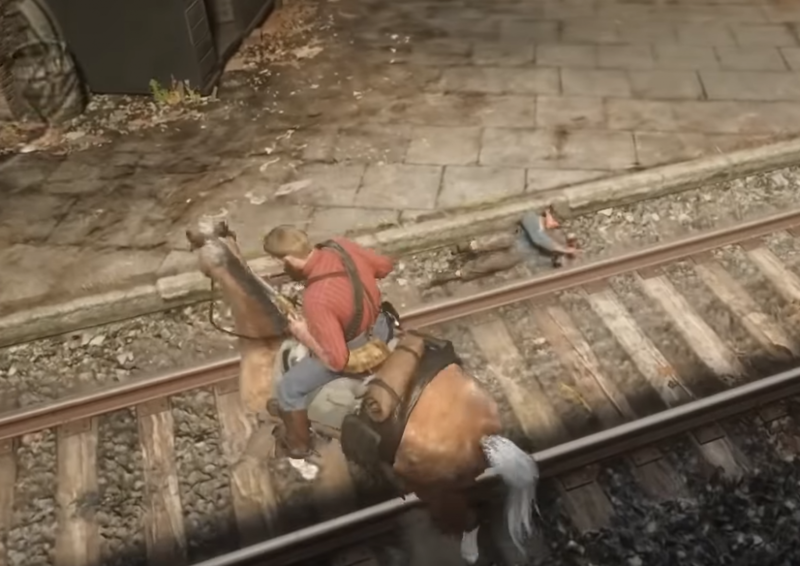 Finally, let’s come down to the worst thing that you could do in RDR2: killing animals. And I mean the domesticated kind, like dogs, and horses. There are no restrictions against you killing just about any animal you see, although it is suggested that you go for a mental health check if you tend to enjoy routinely shooting dogs in the head, or burning horses. 500 headshots to a bunch of NPCs’? Not a problem! But shoot a dog? Seriously?! 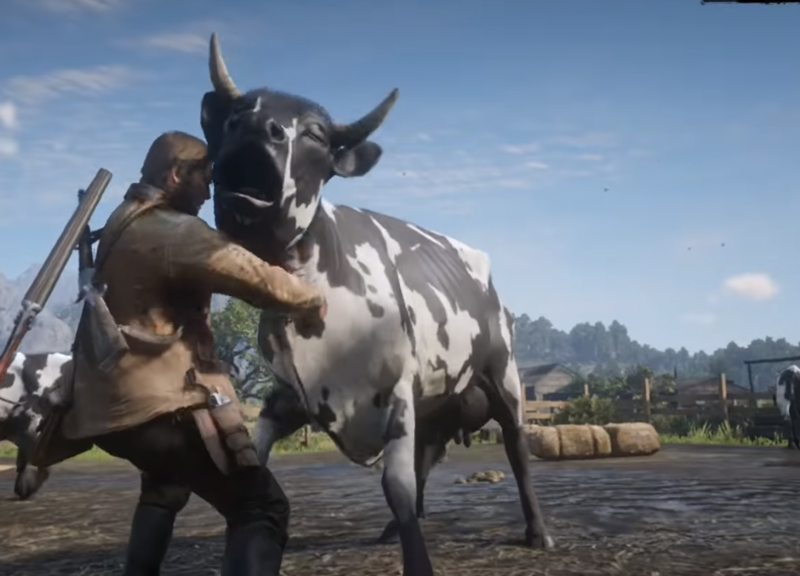 So, there you have it, a bunch of horrifying things you can see and do all around the dangerous world of Red Dead Redemption 2. Of course, this list can only capture a tiny fraction of the horrors and possibilities provided by the game, so I suppose I should leave it to you to expand it.